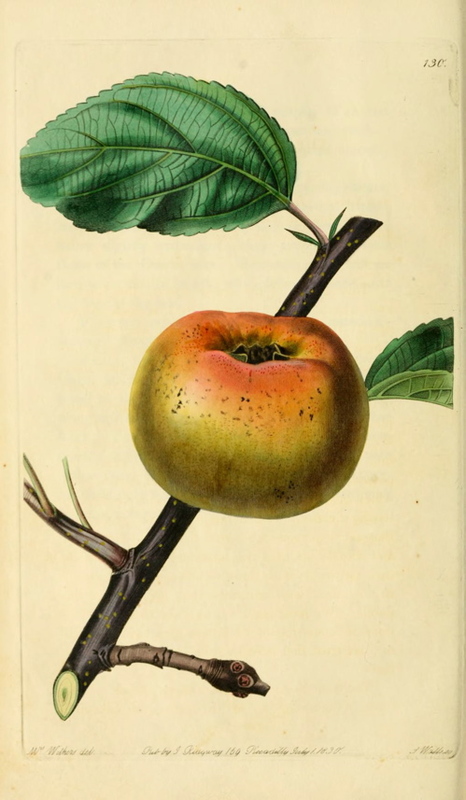 ‘Fruit, large, three inches and a quarter wide, and two inches and three quarters high; roundish, narrowing towards the eye, and angular on its sides. Skin, yellowish-green, covered with large patches of ashy colored russet, and in dry warm seasons, sometimes tinged with red. Eye, open, set in a rather shallow and plaited basin. Stalk, an inch long, slender, inserted in a shallow cavity. Flesh, yellowish-white, firm, juicy, sugary, and richly flavored. A dessert apple of first-rate quality; it is in use from December to March. The tree is a strong and vigorous grower, and an excellent bearer.’ [Hogg p.178/1851]. Introduced in the early 1800s. Produces a small, hardy tree and is an abundant bearer. ‘A delicious little dessert apple of first quality.’ November to February. According to John Lindley one of the finest apples that the English cultivate. [HP pl.XXI/1878]. ‘This variety is of Irish origin, and was first introduced to public notice by Mr. Robertson, the nurseryman of Kilkenny.’ [Hogg p.178/1851]. Described and figured in the Pomological Magazine [PM t.130/1830]. Listed in the 1850 and 1857 catalogues [Apple no.37/1850].